With the Snapdragon 632 Octa Core processor with 1.8 GHz and 4 GB RAM, 128 GB ROM and a strong dual camera with 12 + 5 megapixels, the Meizu Note 8 offers a lot for the low price. 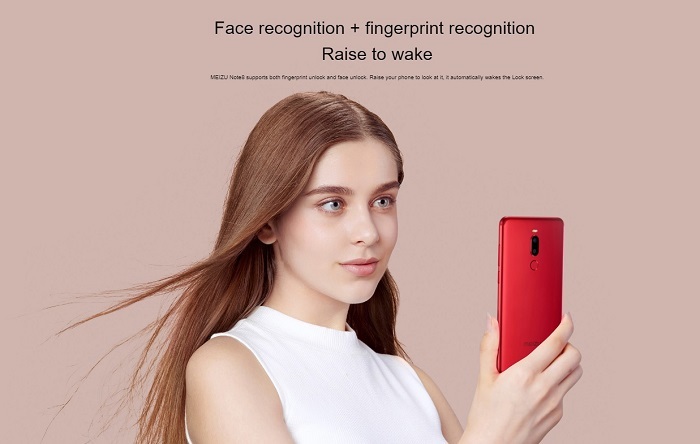 High-resolution 5.99 inch FHD+ display and Face Unlock are also available. The Global offers Band 20 and Global Firmware. Lots of features for the small purse. The Meizu Note 8 with its Snapdragon 632, 5.99 inch FHD+ display and high-quality metal case is unusually well equipped for this price category. The harmonious overall package is rounded off with a strong camera combination on the back as well as a full feature package. 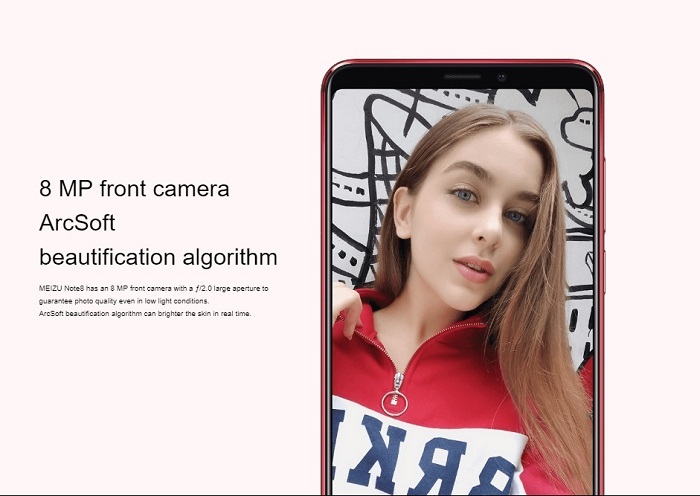 Meizu also followed its own design path with the grade 8 and refused the Notch design offered by the competitors. The result is a refreshingly different look that, despite its budget price, is absolutely convincing. One reason for this is the narrow edges of the display. The case also plays its part. This is made entirely of metal and feels correspondingly valuable in the hand. The dimensions are also pleasing. The technical gem from China measures only 75.5 x 153.6 x 7.9 mm. Despite its rich features, the mobile phone weighs only 168 g.
The main weakness of many smartphones in the mid price range is the display. This is not the case with the Meizu grade 8, because the 5.99-inch panel inspires with crisply sharp images with a resolution of up to 2160 x 1080 pixels. As a result of the FHD+ standard, the smartphone has a pixel density of 406 ppi. Direct sunlight is of course no problem for the screen. With 450 cd/m² a sufficiently high light output is offered. A perfect companion for everyday life... The Meizu Note 8 offers a successful balance between performance and endurance. Powered by a Snapdragon 632 processor with a clock rate of 1.8 GHz and eight cores, and supported by 4 GB RAM, the phone offers more than enough power for popular apps and even current mobile games. Qualcomm's CPU boasts low power consumption. So the Meizu Note 8 performs faithfully, even on exceptionally long days, without having to recharge it often. 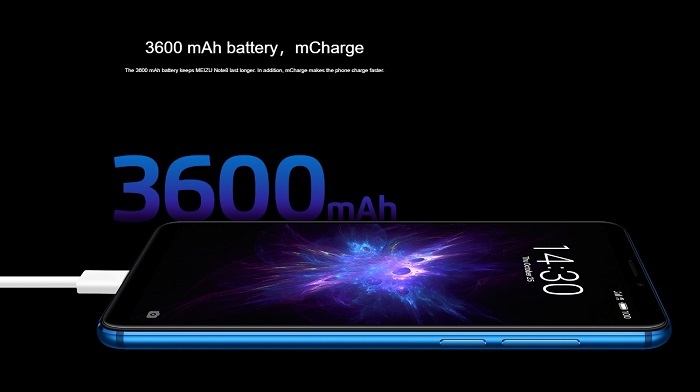 However, if the 3600 mAh battery is discharged sooner than expected, the in-house mCharge quick charge mode ensures that the device will be ready for quick use again. There is one thing that should never be missing in 2019: The dual camera with appealing bokeh effects. The Meizu Note 8 is perfectly equipped for these purposes and offers a successful combination of 12 and 5 megapixel cameras. 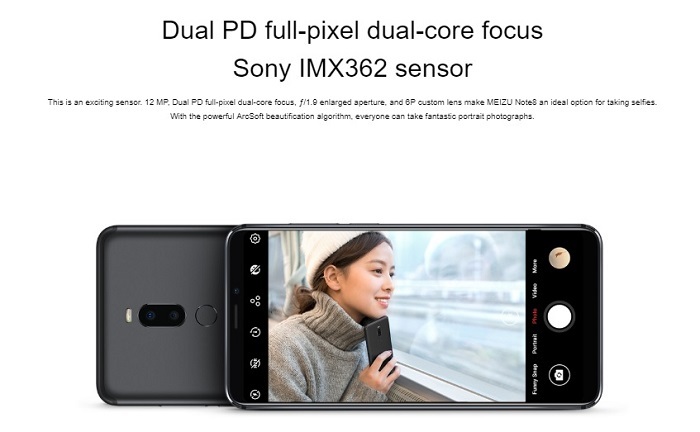 The Sony IMX 362 primary sensor is equipped with an f/1.9 aperture and captures a lot of light, which is particularly beneficial for shooting in unfavourable lighting conditions. The front is also well equipped for occasional snapshots. The 8 megapixel sensor is equipped with an f/2.0 aperture. The ArcSoft Beautification Algorithm should not be missing here, of course. This provides for improved shots. Good display, powerful processor and a successful camera combination. But the Meizu Note 8 offers much more than that. The internal memory of 64 GB is also impressive. Even gamers who want a large selection of games installed at the same time get their money's worth here. The headphone input is also pleasing, which is no longer a matter to be taken for granted nowadays. Owners of smartwatches and wireless headphones will be delighted with the energy-saving Bluetooth 4.2 standard. Locational services can, of course, be used without restriction. The smartphone uses three standards at the same time: GPS, GLONASS and both navigation. For unlocking, complicated patterns no longer have to be imprinted. The fingerprint sensor on the back of the case unlocks the screen for its owner in the twinkling of an eye. Alternatively, the lock can be lifted via Face ID. The connection speed is also positive. FDD LTE and WLAN a, b, g and n are also on board on the Meizu Note 8. 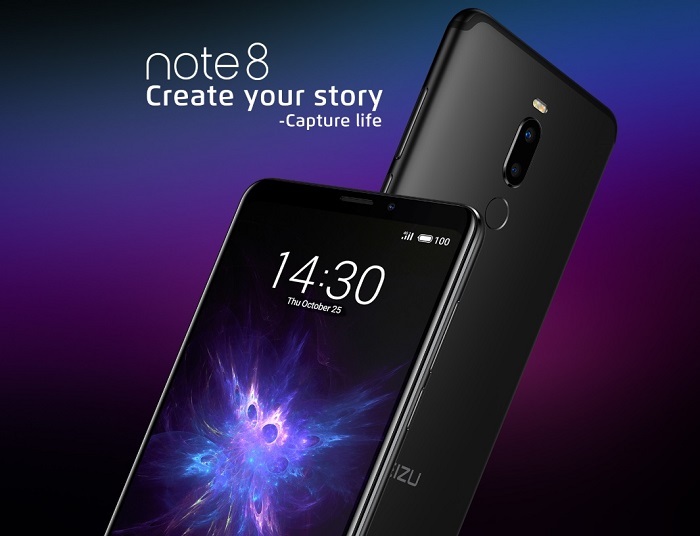 Notify me when the Meizu Note 8 - Snapdragon 632 - Dual Camera drops in price.